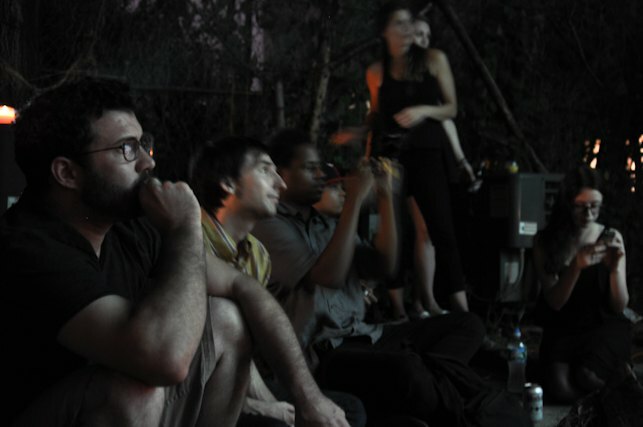 A few weeks ago, my music blogger friends approached me about hosting an electronic music showcase in my backyard on Troutman street. The show was proposed and put together by Brooklyn-based blog Stadiums and Shrines, LA-and-Chicago-based record label and music collective Absent Fever , and Eric from one of the featured bands, Phantom Power. My roommates and I liked the idea but hesitated at first considering the unpredictable nature of house shows, but that was before we saw how passionate these DIY bloggers were about the artists performing. My first concern was noise, but then I remembered- We live in BUSHWICK. The town that hosts rooftop shows on an almost-nightly basis, where you'll hear the same reggaeton beat pounding from cars across the area for hours at a time, where music venues blossom in storage venues, where even the fried chicken store on the corner blasts mariachi. 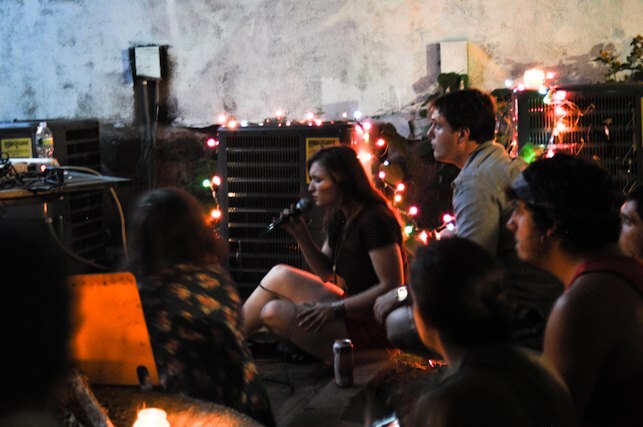 This neighborhood radiates music- with a latina culture built on music, a haven for indie artists, experimental musicians, and DIY party-throwers- why shouldn't we host that energy for one night? 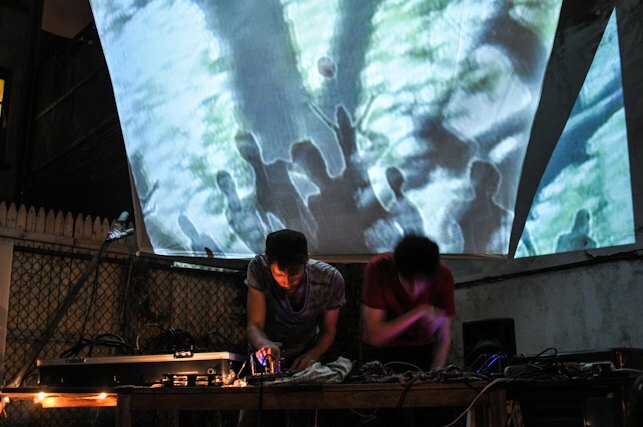 Our contribution to the noise of the 'hood for one early evening showcase was made up of tight, mellow, intricately understated electronic music was a drop in the bucket. Turns out not even our (strict) super complained about the music and our kid neighbors (who happen to be little girls) watched the show from their fire escape and giggled the whole time. Despite rumors of rain and worries for a muddy yard, the show went without a hitch. Our backyard is a huge space and we do our best using it for parties and bbqs, but it has challenged us at times with mud, neighborhood cats, crazy-looking bulbous weeds, and failed attempts at gardening. When I re-entered my backyard, and it was a completely different place- projections sprawled across a sheet, music equipment crowded our dining table, a huge tv flashing colorful graphics, candles kindling the good vibes. 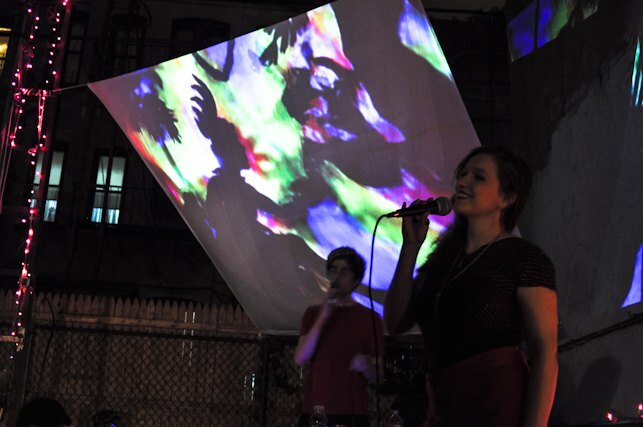 The fantastic, kaleidoscopic live projections came on behalf of Nivan Yahaghi, who was in from Chicago for the event. The assortment of musicians and otherwise creatives filled the space ate hot dogs and met eachother, joining in a random backyard at 8 pm on a thursday night to see live music by word of online blogging. 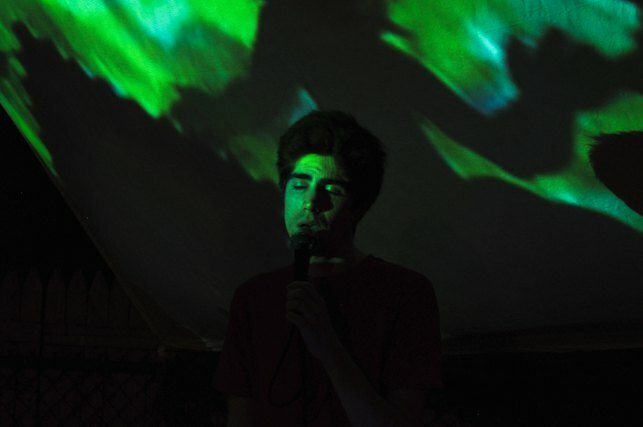 The show started with a set from Kohwi, an electronic artist from Ann Arbor who often graces the city with his mystically charismatic style. Playful and pulsing, vocals chorally bouncing from speaker to speaker, his songs seem to emit a rainbow of sound. 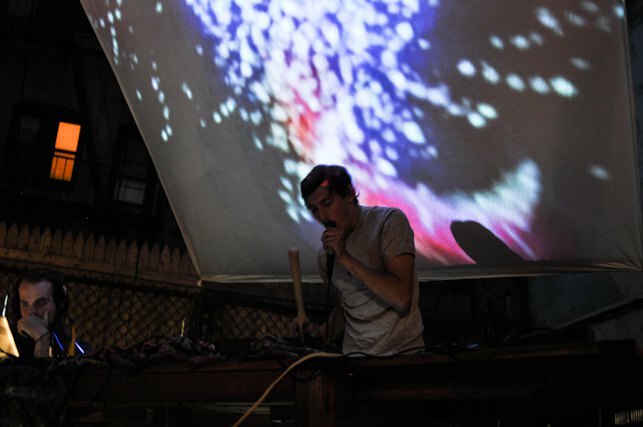 His set transitioned into that of Headaches, a Brooklyn glitchy-hop musician who remixes vocals to looping, wordless patterns, and creates houses of mathy beats to rest melodies atop. A type of abstract, feeling-evocative sound/dance music, it was lovely. Phatom Power (or, Phantom Posse, when joined by others), who has been haunting NYC with his drippy synth silk for a while now, took the yard next. Featuring Eric, who does petal magic and croones in his lo-fi way and Nadia Hulett (who we previously wrote an article on), joining him to food the songs with soaring vocals, shaking up the sleepiness that lives in their chillwavey beats. Fantastic. Lastly, It Is Rain In My Face, strange name but incredible music from a one-man-band. A truly beautiful sound, with a archaic voice that sounds like it belongs in 90s alternative rock, accompanied by faithful full-bodied guitar and vocal melodies on a bed of electronic flourishes. Strangely otherwordly and superbly nostalgic, perfect way to end the showcase. An incredible event with sweet music and a great turnout- the vision of Dave of Stadiums & Shrines , Elouise and Tyler of Absent Fever and Eric of Phantom Power executed beautifully in my own backyard- a space I'd never imagined would suit a music showcase so well. But, hosting such a successful and awe-inspiring event was an eye-opener. 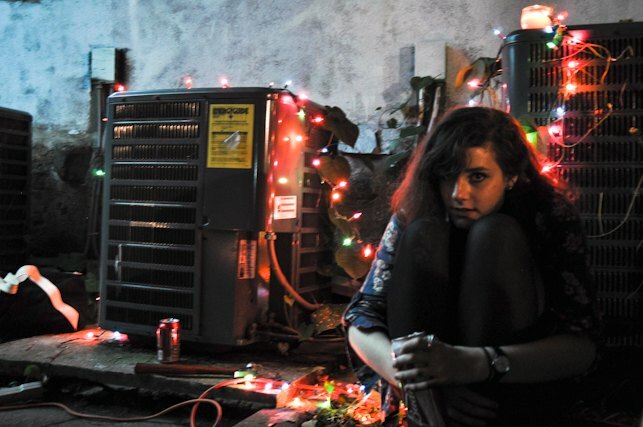 This is the land of in-house galleries and apartments that double as music venues. 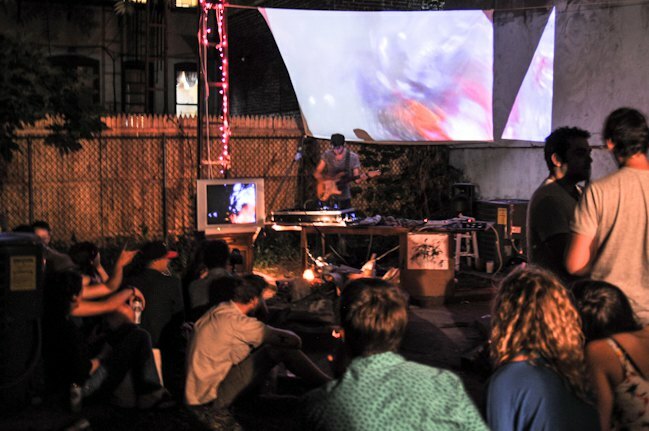 If you want to get involved with Bushwick's creative scene it's easy to find events happening every night, it's fun to find others to collaborate with. 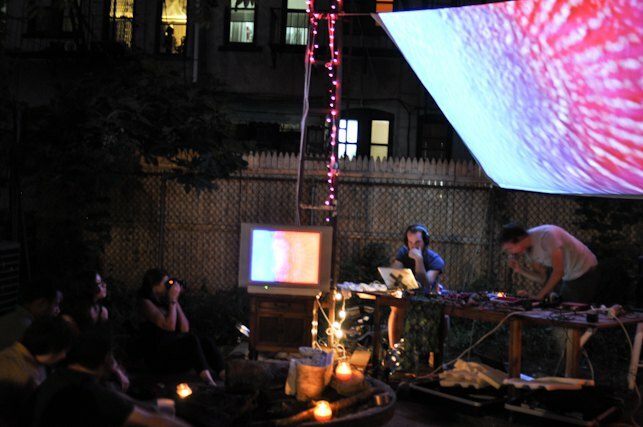 If someone wants to responsibly borrow your backyard/rooftop/front stoop for a night to fullfil their creative vision, say YES! I guarantee you'll end up inspired yourself.